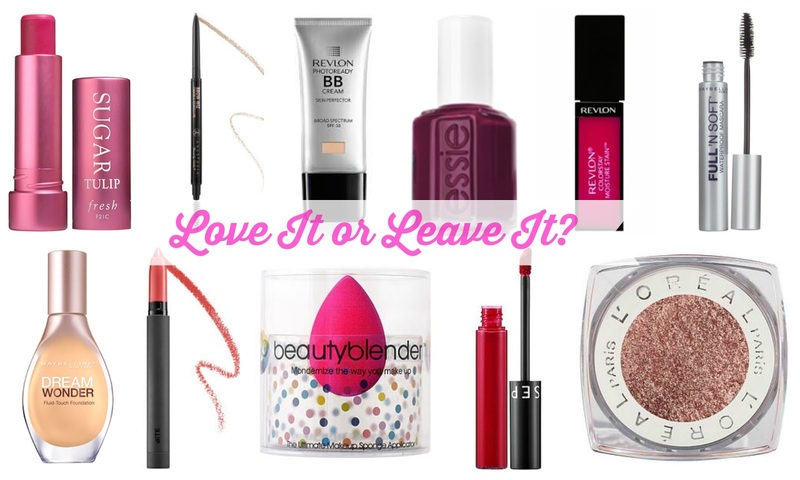 Makeup Over Mind guest post - Love it or Leave it? Today's guest post is courtesy of one of my favourite bloggy pals ever, Orla from Makeup Over Mind. In my mind, that's her full name and even called her that in Space NK earlier this year, such is the power of a catchy name like that! She has written a cracker of a guest post, one that will help me save and spend money at the same time! During the summer, she went on a jealousy inducing journey around America and did me proud with her purchases. I made notes then and now she's got the low down on things I need to buy and avoid. Good bridie yourself Orla from Makeup Over Mind, good bridie yourself. You might remember my mahoosive (and I mean re-mortgaging kind of big) beauty haul around the U S of A this past summer. To give you an idea of what we're talking about, I managed to reach Sephora VIB status within 6 weeks of our first Sephora Visit. My other half "fondly" remembers each and every one, referring to our time there now as "The tour of all the Sephoras in America". Catchy title, and honestly I think a genius tour-group idea! So now that the dust has settled, and Lovely Girlie Bits have jetted off to the place of giant food and mini makeup, it got me thinking.... I got A LOT of stuff, a mixture of hight-end and drugstore, but here's how I might have done things differently. We can't get this shade in Ireland and I'm at a loss as to why. You absolutely need this. It's been over 4 months and we are still, as they say in Connemara, "in the love". I can't explain it but the hype is real. This has become one of my daily essentials and though we can order online, it's not yet easily accessible over here. No regrets at all. On my third tube, and thanks to the Viva Adonis girls for the heads- up on this one. This mascara is everything that I want - good volume without clumping, it's also lengthening, and holds a fine curl. A great everyday go-to and all-round star in my books. Again, why it's not available to us in Ireland is one of the world's greatest mysteries. Where do I even start. It's a total game-changer and unlike any other makeup sponge I've ever tried. I will be needing several back-ups. Don't know why I resisted for so long. It seems pricey but it's so so worth it. Check out some of my recent tutorials if you want to see it in action. A divine matte formula that's really comfortable to wear and unlike anything else that I won. These had only been release when I was there and stock was pretty low, but there is a beautiful colour selection and I'd love to get some more. Fresh Sugar Lip Treatment in Tulip. A lip balm with a punch. An easy to wear formula that smells like those fizzy cola lollies from years back. Amazing. I searched high and low for this for weeks and hoped it would be akin to my beloved L'Oreal Eau De Teint with a wider colour selection. Alas, it was not meant to be. I's a "like", not love situation. And having tried a myriad of application techniques, I've finally accepted that I could've really given it a miss. See my full review here. A bit of a random one I picked up in Ulta one day when I was looking for a light-coverage base to go with my tan. Just a very middle of the road base that has something a little greasy about i. I can make it work, but it's too much work really. Nothing to write home about. This might be a controversial one. It's a much loved shade, it really is gorgeous, and the formula is one I was super excited to get my hands on. However, after about a half hour of wearing it, I had to take it off. My lips have never felt so dry or uncomfortable. It was particularly unfortunate as we were out and about at the time and I had no makeup remover so I had to work with water and tissue in a public toilet... And this guy seriously stains. I've been too scared since to give it another go so perhaps I should have left it. Another one I was super excited to try, but again I was left a bit underwhelmed. I adore lip products and this just wasn't up to par in my books. Maybe just not that kind of thing I look for in a lip product. A bit "meh" for me. Another potentially controversial one. It's a beautiful shade, don't get me wrong, but I'm so disappointed with the opacity. It's one of those fairly sheer/streaky shades that needs to be built up and frankly, it's just a lot of work to apply. When you take the time, it's a beautiful finish, but if I could go back, I'd leave it. Orla from Makeup Over Mind, you have done me proud. As I sit on the plane typing this out, I am giddy with excitement and definitely plan to pick up Amber Rush, some Bite products, a Beauty Blender and thanks to you, I already have the Maybelline Full N Soft mascara which I love! Thank you so much for continuing to enable me like nobody else and I'll do you proud! Make sure you follow Orla everywhere because she's one of the best Irish beauty bloggers and vloggers out there! *makes mental notes for when I finally get to go to New York*. I just got Bahama Mama last week and I love it. 2 coats for perfect opacity, nearly there at 1.....maybe you got a dodgy bottle Orla? Disappointing alright as it is a lovely colour.